We all know how frustrating it can be to do everything you’re supposed to do and yet see nothing change for the better. This can happen in all areas of our lives, but it is perhaps most trying when it comes to our health. Author Farnaz Afshar knew such frustration. Suffering from a range of physical ailments, she became sicker and sicker and was unable to recover using conventional medicine. 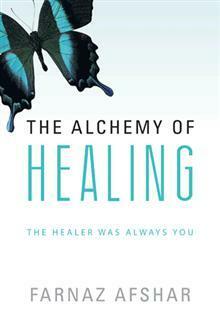 The Alchemy of Healing: The Healer Was Always You tells of Afshar’s discovery of her self-healing power, documenting her journey from illness to well-being. She shares her own story of healing and offers a collection of thoughts and life lessons to help others experiencing illness. She has come to the conclusion that the cause of every illness is the same, making it possible for anyone to achieve relief from any illness by applying the same Law of Attraction principles she learnt. Each chapter guides you through your own path to recovery from whatever illness you have. You can discover your inner strength and self-healing capabilities. The health you desire is in your hands. You, and only you, can really heal yourself! Are you ready to heal your life? I wrote the book that I wanted to read, the book that builds on years of experience from myself and others, to give you a leg up and kick start your unique healing process. What an eye-opener. Farnaz is quite clearly a tremendously skilled LOA practitioner, but here she is, describing her trials and tribulations with true humility in this book. I read this book at a stage of my life when I was just transitioning out of the mentality “LOA doesn’t work for me” to “It’s all in my hands”, and the timing of reading this book couldn’t have been more helpful. It takes a lot of time and pain to finally face up to the fact that our physical ailments are indeed all results of what we think and nothing else. Often our resistant thoughts are so familiar to us that we don’t notice them. Watching our own feelings like a hawk is the only way to the path of well-being. Anyone who has listened to Abraham-Hicks and felt that it’s not working for them should read this book. Farnaz really bring A-H teachings to life.